Cranberry (Vaccinium macrocarpon) is a member of the same family as bilberry and blueberry. The ripe fruit extract in Cranberry health supplements contains significant amounts of antioxidant Proanothcyanidins (OPCs) which have a detoxifying, diuretic, and antiseptic (anti-adhesion) effect for urinary health and other common infections. Cranberry & Bladder/Urinary Health*: The urinary tract is vulnerable to bacterial infections because of the ability of bacteria to bind/adhere to the wall of the bladder and urethra. The use of cranberry for urinary tract/bladder health is very effective, as confirmed by several scientific studies of Urinary Tract infections (UTIs) . 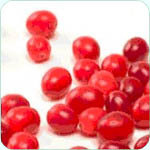 Cranberry contains a natural sugar, D-Mannose which prevents e-coli bacteria from sticking to the wall of the bladder, preventing their colonization of the urinary tract, so that they are flushed away with urination. Cranberry & Womens Bladder Health: Women are 10 times more likely to experience urinary problems than men. Frequent or chronic urinary tract infections (cystitis) occur in women because the female urethra is only two inches long and straight, making it easy for bacteria to reach the bladder. Cranberry & Mens Bladder Health: Cranberry is effective for men who have difficulty passing urine and emptying their bladder properly, such as BPH or enlarged prostate. When urine remains in the bladder, bacteria have a greater chance of attaching to the bladder lining. Dental plaque is composed primarily of oral bacteria that have attached themselves to the tooth and gum surfaces. Cranberry acts like Teflon® for teeth, making it difficult for the bacteria that causes cavities to cling to tooth surfaces. Stickiness is everything for the microbe Streptococcus mutans, which creates most cavities by eating sugars and then excreting acids which erode and decay the tooth. Peptic ulcers are increasingly being attributed to infection by Helicobacter pylori bacteria, as opposed to stress and/or stomach acidity. Lab research showed that a constituent of cranberry inhibits the adhesion of H. pylori to human gastric mucus. These preliminary results suggest that cranberry may be beneficial in the prevention of peptic ulcers through the inhibition of H. pylori adhesion to gastric mucus and stomach epithelium. Cranberry Juice vs Supplements: The National Kidney Foundation recommends drinking at least one large glass of cranberry juice a day to help maintain urinary tract health. Most cranberry juices have added sugar, so Cranberry supplements are a better natural health option +1-2 pints water daily. Cranberry supplements can provide you with an exact, pharmacologically effective daily dose of the natural biologically active substances. Cranberry extract is also high in natural vitamin C and other natural antioxidants and tannins. Uva Ursi: Uva Ursi or Bearberry has a marked antiseptic and astringent effect on the membranes of the urinary system, soothing, toning and strengthening them.